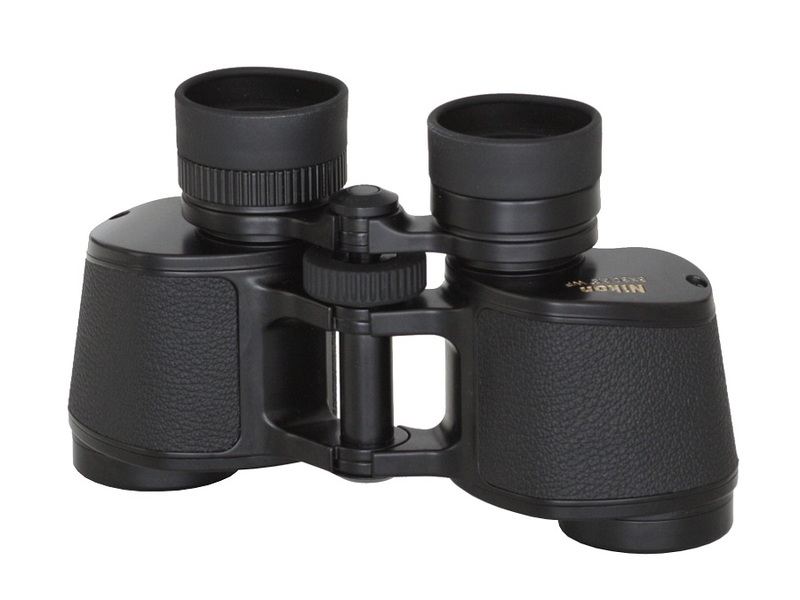 Legendary binoculars - Nikon 8x30 EII - Nikon 8x30 EII - 1999- now - AllBinos.com . 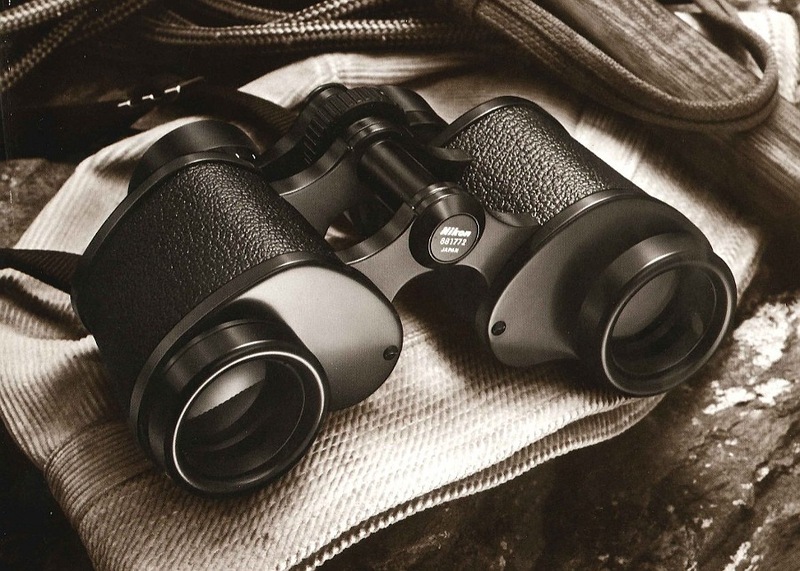 The golden age of Porro binoculars lasted several dozen years and started right after the World War II. Among many models the 8x30 devices were undoubtedly the most popular ones. Zeiss factories, moved to Oberkochen, started their production from that model exactly; Leica were still manufacturing the Binuxit model, launched before the war, and Swarovski showed their Habicht 8x30W on the market at that time as well. What’s more, in 1950 the first Steiner 8x30 was launched and the eastern German Jena was inundating the market with their Deltrintems and then Jenoptems. These parameters were very popular with other Eastern Block producers as well - it’s enough you mention here the Polish PZO LP8x30, the Russian BPC 8X30 which had five different versions, the Czech Meopta or the Rumanian IORs. In the USA Bausch & Lomb was cementing their position on the market by selling a very well-done Zephyr 8x30 model. Today’s Japanese optics giants weren’t idle either – after all at that time they had yet to win their share of the market. The 8x30 models were offered by Canon, Pentax or Fuji and also Nikon tried their hand at it. 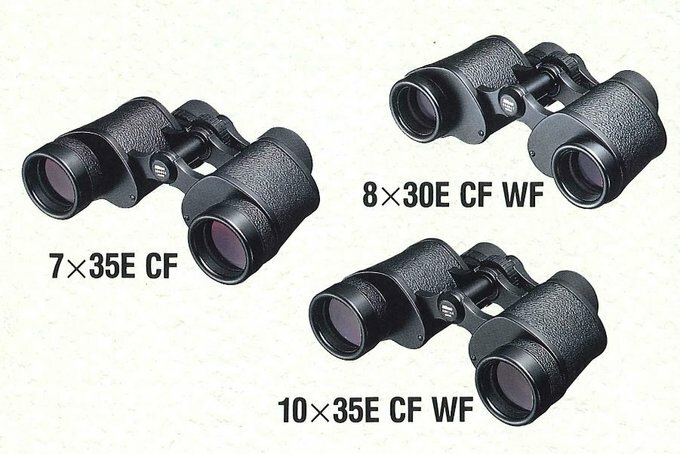 Already in the 50s of the 20th century, when they functioned under the name of Nippon Kogaku, they launched the 8x30A with the field of view as wide as 8.3 degrees. It was able to compete successfully on the marked till 1978 when the E series was launched, consisting of the following models: the 8x30, the 7x35 and the 10x35. 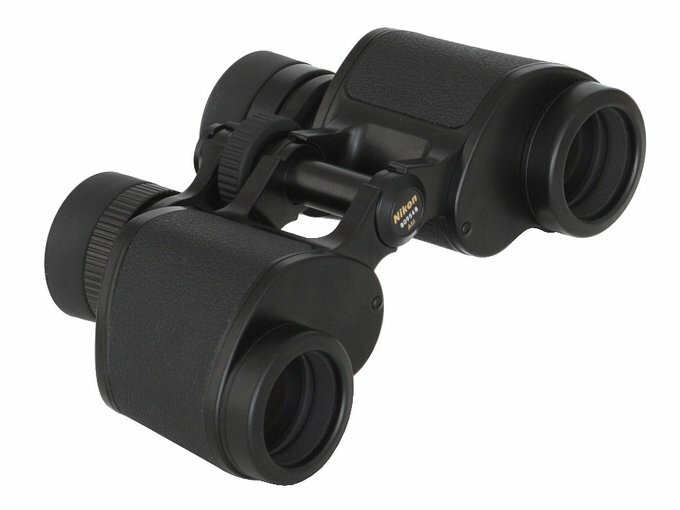 Compared to the 8x30A model the field of view didn’t increase, as it still amounted to 8.3 degrees but the outer and inner eyepiece construction changed. The eyepiece of the Nikon 8x30 E consisted of five elements positioned in three groups (the 2-2-1 design) which eye relief distance amounted to 13.1 mm so was far more comfortable than that of its predecessor. What’s more a rubberized eyecup was introduced as well. The objective lens remained a classical cemented achromat which distinguished the Nikon from such devices as the Zeiss 8x30B, which featured telephoto lens with air spaces between objective-lens elements. 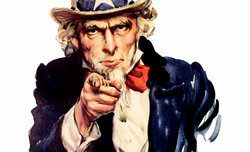 A page dedicated to E series from the Nikon catalogue published in the 80s of the 20th century. Still over twenty years had to pass until you saw the Nikon’s successor and during those twenty years and in the period preceding them everything changed. The East German Carl Zeiss Jena ceased to exist and Analytic Jena, the company which took over, continued the production of the Jenoptem 8x30W for a very short time, selling it under the name of Docter Classic 8x30W. The West German Zeiss ended the production of the 8x30B model in 1968 and Leica finished with the Binuxit in 1962. Canon switched to stabilized pairs of binoculars, Minolta was heading for collapse and Bausch & Lomb handed down the production of binoculars to Bushnell, focusing mainly on medical equipment and contact lenses. Only Swarovski and Steiner remained on the field of high quality Porro 8x30 devices. E series as presented from the 1991 Nikon Sport Optics catalogue. Nikon didn’t wish to stop, though, and in 1999 they showed a product which, to this day, is considered by connoisseurs one of the biggest achievements in that area. We think here of course about the already cult 8x30 EII model. 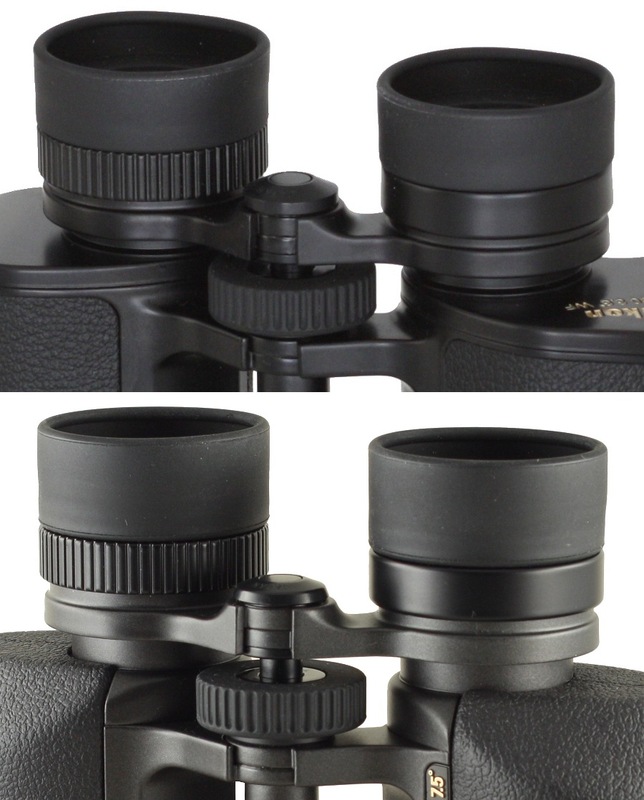 A comparison between the focusing mechanism and the eyepiece design of the Nikon 8x30 EII (top) and the 8x32 SE (bottom). 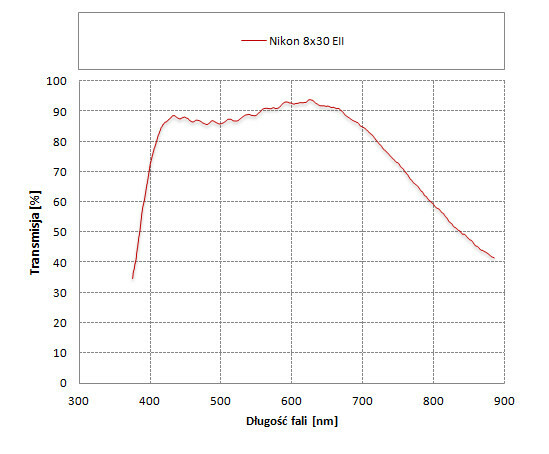 The Nikon 8×30 EII wasn’t made from scratch – it seems a lot of solutions offered by Nikon previously were incorporated in it. The objective lens for instance seems to be exactly the same as in the E model. Once again we deal here with a cemented achromat as fast as f/3.8. A lot of parts of the ocular bridge seem to be the same as in the more expensive SE series, especially the 8x32 SE model, launched in 1998. Small wonder – such unification lowered the production costs and the cheaper model can only profit from the fact that it shares some parts with a more expensive model. The Nikon 8×30 EII is a classic Porro device; still the asymmetry of the prisms is untypical here. The prism positioned further from the objective lens, the first which catches the light beam focused by the achromat, is bigger. The next prism is noticeably smaller. I don’t hesitate to write that a new eyepiece construction of the 8x30 EII and the 10x35 EII models was also the key to their success. Compared to the 8x30 model they added one optical element and, as a result, you deal with 6 elements positioned in 4 groups. The field of view is wider and the eye relief more comfortable. While the 8x30 E model was weaker than many of its competitors (e.g. the Jena-produced devices which featured a field of view of 8.5 degrees), the 8x30 EII with the field amounting to 8.8 degrees managed to outperform all of them. What’s more, the edges of that field were corrected better than those of many competitors which offered a field ranging from 8.0 to 8.5 degrees. The eye relief didn’t increase significantly and in the new model was 13.8 mm. The precise diagram of the 8x30 EII cannot be found in any Nikon catalogue we’ve seen so far; still the lecture of patent pending might be helpful here. In June 1996 Mitsuhiro Janai from Nikon Corporation filed a patent pending no. 5774270 and it was published in June 1998. It is entitled Wide-field eyepiece lens. 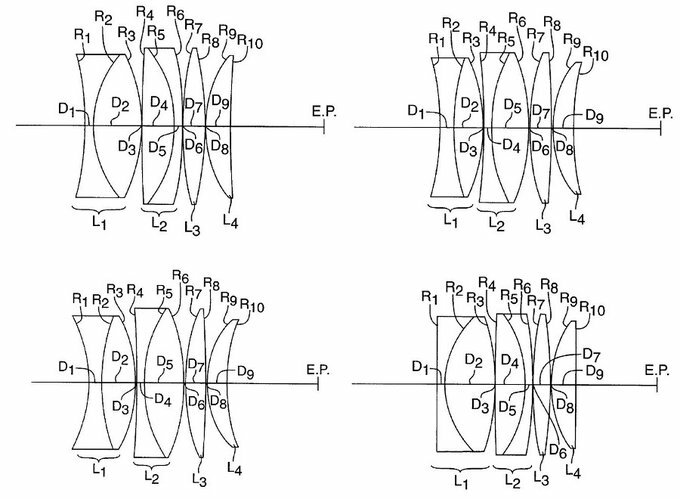 You can find there four diagrams of an eyepiece with 6 elements positioned in 4 groups; the author touts it as an instrument with an apparent field of view of more than 60 degrees, preferably more than 70 degrees, and a large eye relief of more than 80 percent of the focal length of the eyepiece, perfectly suitable for microscopes and binoculars. 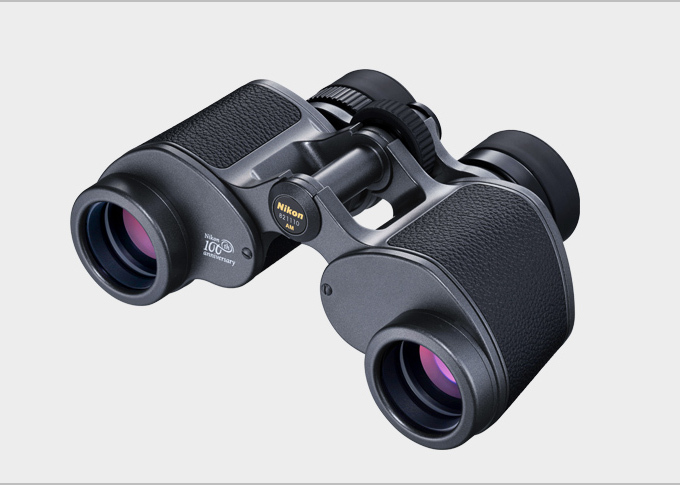 It all remains in complete accordance with the results of the Nikon 8x30 EII and the date of the patent publication suits as well, exceeding just slightly 1999, the year of the launch of the pair of binoculars we are describing here. 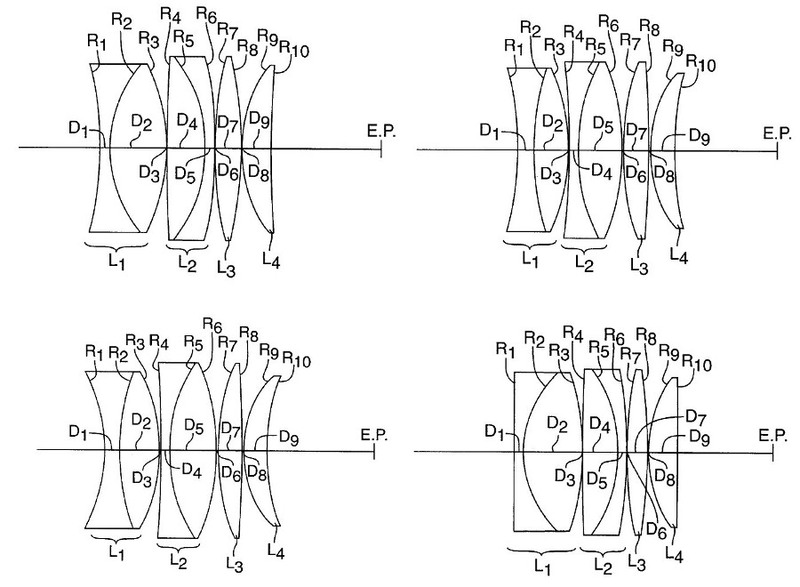 Diagrams of the wide-field eyepiece from the patent of the Nikon company. Courtesy of one of our Readers we know that in fact the construction of the Nikon's 8x30 EII eyepiece is a bit different. It's enough to glance at a photo below, showing what that pair of binoculars looks under X-ray, and you see the difference. 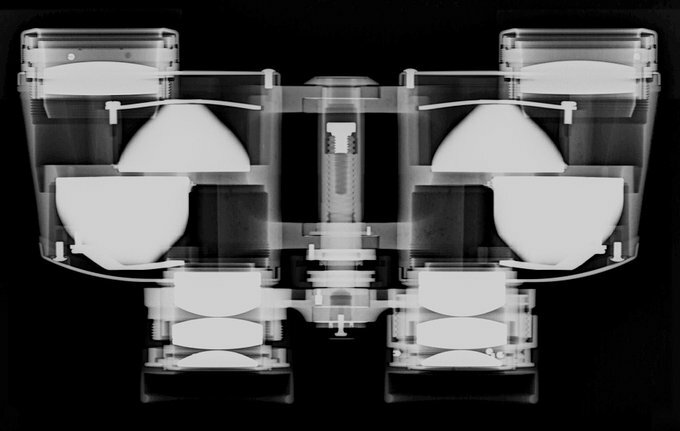 X-ray image of the Nikon 8x30 EII binoculars.. Photo by Obserwatorek. The eyepiece indeed has 6 elements positioned in 4 groups but, while in the patent you deal with a 2+2+1+1 set on the photo you see a 1+2+2+1 set. When in the case of the construction of the eyepiece the progress from E to EII was a huge leap forward, there is one aspect in which the company took actually a step backwards. Due to a drive to economize they changed the case. With the E series binoculars you got a small Japanese masterpiece of the leathercraft art in a form of a beautiful, hard case. The new series comes with a soft case, produced in China, which doesn’t stand out at all. On the left a case added to the E series, on the right a case added to the EII series. Also the antireflection coatings were changed. The E series appeared on the market with simple, one-layer magnesium fluoride coatings. At the end of the 80s and at the beginning of the 90s they were superseded by mutli coatings. The Nikon catalogue from 1991 indicates very clearly that the multi coatings covered not only all surfaces of elements but also the prisms, from all their sides. It seems the EII series features multi coatings from the very beginning and you cannot exclude a possibility that they have been improved on since 1999. The transmission graph presented below shows how they perform. 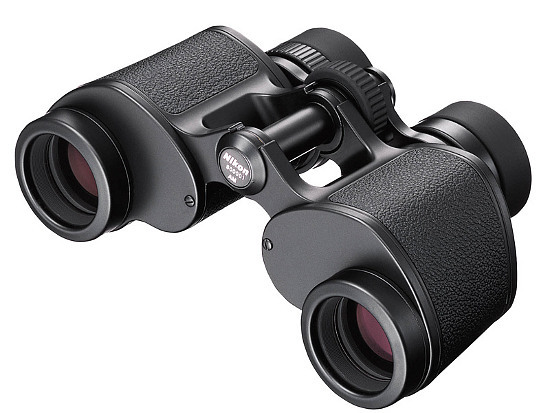 It is a nice graph but, for a contemporary Porro pair of binoculars, it still leaves something to be desired. We are especially concerned by that depression for green light, in perfect accordance with the colour of the coatings which are dark green, indicating that the biggest amount of light is reflected from the optics in that part of the spectrum. The Nikon 8×30 EII features 14 air-to-glass surfaces (2 on the objective lens, 4 on the prisms, 8 on the eyepieces). If they employed coatings of the highest quality, which on one surface lose only 0.3-0.4% of light, the transmission value would amount to 95% in the centre of the visible spectrum. It is clear the EII series can be improved in some areas. 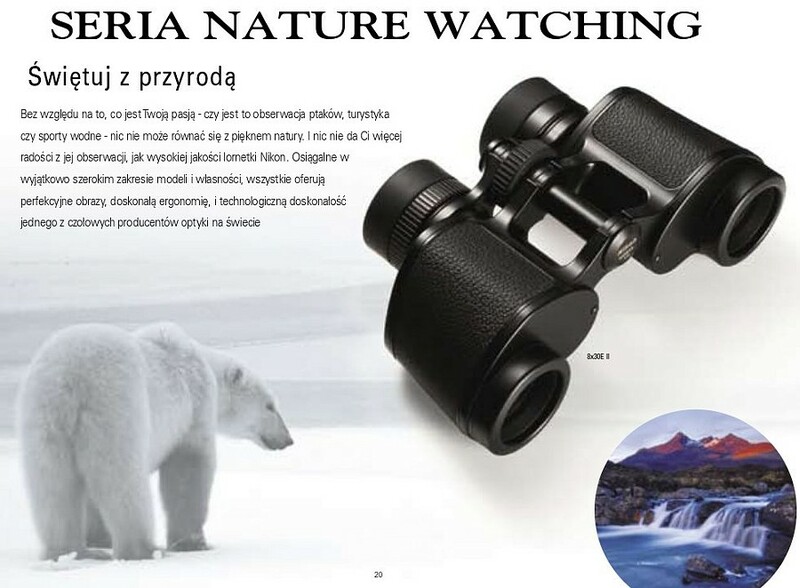 A page from the Polish Nikon Sport Optics catalogue from 2008–9. Even if the EIII or the SEII models will never be launched on the market I think the EII series should be definitely continued. It is renowned and universally praised, not only by the professionals. The EII models appear regularly on the festivals and rallies organized by Optyczne.pl/Allbinos.com where they have already gained a lot of admirers. It’s enough to say that currently out of all European countries the biggest number of 8x30 EII binoculars is sold exactly in Poland. 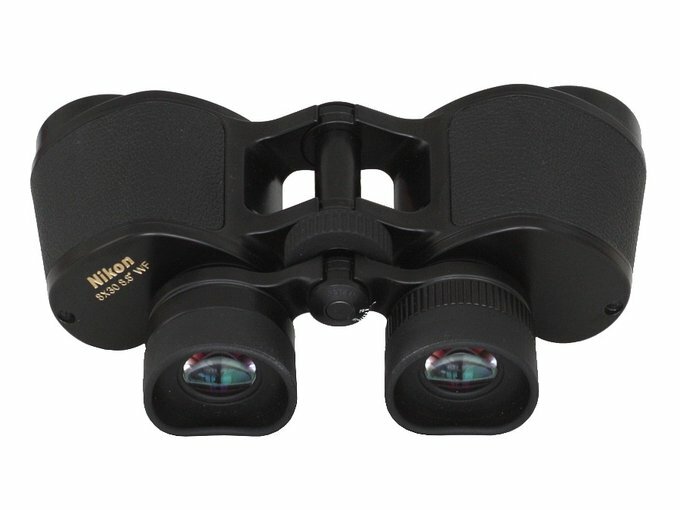 Instead of promoting cheap Aculon models which can only discourage and dishearten more demanding users and put them off Nikon products, it would be far better to suggest the purchase of these classic devices which can prove that Nikon still belongs to the best sport optics producers in the world. My house has seen several hundreds of binoculars. All the household members are used to them and they have had a chance to look through many great instruments of really high quality. Still I’ll never forget the moment the first Nikon 8x30 EII specimen was brought along. My wife took it into her hand, looked through it and after a while exclaimed: “I want one of these too!” It would be difficult to find a better ad for this beautiful classic. Update (April 2017): 400 pieces of 8x30 EII 100th Anniversary Edition appeared on the market and were supplied with limited edition case and strap for the 100th anniversary edition.